Unlike a solar panel installation or a natural gas plant, you might not see energy efficiency on your daily commute. But it’s a very real resource with a very compelling reason for utilities to invest in it: it’s typically the lowest-cost way to meet customers’ energy needs. By helping customers install efficient appliances, insulate their homes and buildings, and refine operations and maintenance practices, utilities are investing in the lowest cost energy resource out there. Energy efficiency programs aimed at reducing energy waste cost utilities less than three cents per kilowatt hour, while generating the same amount of electricity from sources such as fossil fuels can cost two to three times more. This isn’t a surprising result. Energy efficiency has remained consistent as the lowest-cost resource over the past decade even as program administrators have become more ambitious, capturing more energy savings in more markets and in more creative ways. 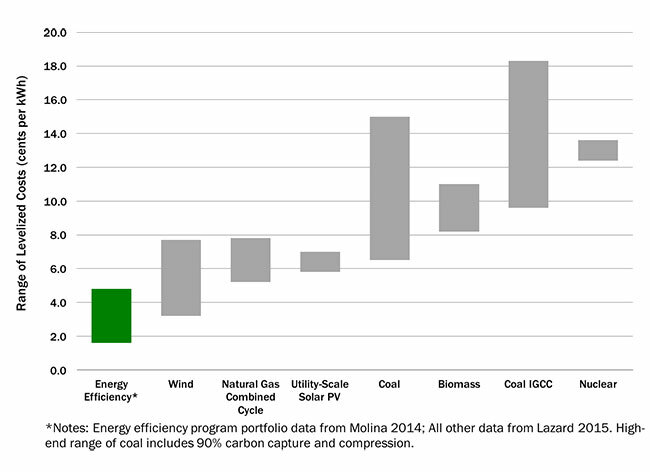 Investments in energy efficiency can have a big effect. In fact, in the Pacific Northwest, over half of the region’s growth in demand for electricity since 1978 has been met with energy efficiency. By choosing this low-cost resource, utilities have saved customers about $3.75 billion per year. For more on the cost of energy efficiency, see The Best Value for America’s Energy Dollar: A National Review of the Cost of Utility Energy Efficiency Programs.